Patagonia is on a cross-country mission to change America's relationship with stuff. From now through May 12, the outdoor-apparel firm will be hitting the road to dole out free clothing repairs, teach mending techniques, and sell used Patagonia gear. Rest assured, your togs will be in good hands. Patagonia's repair facility in Reno, Nev., is the largest garment repair facility in the United States, completing about 30,000 repairs per year. The "Worn Wear Mobile Tour" begins in Ventura, Calif., where it'll stop at various retail locations, coffee shops, farmers' markets, and trailheads along the way before landing in Boston. The mobile repair shop, which comes with an industrial Juki sewing machine, will be open to anyone who brings in a garment, no matter what the brand. Besides educating visitors about the brand’s “Worn Wear” program, Patagonia also promises a festive atmosphere, with food, drinks, and live music added to the mix. The Worn Wear wagon is, on its own, a sight to behold. A one-of-a-kind custom vehicle created by artist-surfer Jay Nelson, the truck comprises a solar-powered camper shell (made from salvaged redwood wine barrels) mounted on a biodiesel-powered ’91 Dodge Cummins. 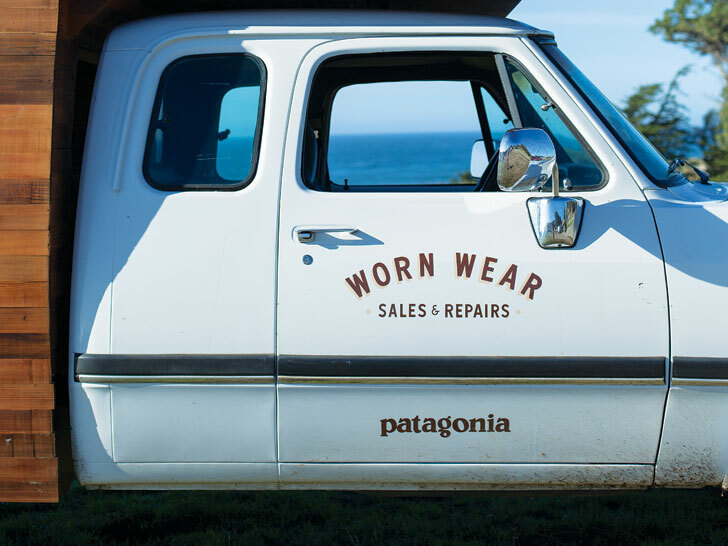 Patagonia created Worn Wear in 2013 as a way to inspire people to make their clothes last a lifetime. The program aims to keep clothing—regardless of brand—in circulation for as long as possible, according to Rose Marcario, Patagonia’s CEO. When it’s time for a replacement, Patagonia wants you to invest in something that will serve you for years—even decades—to come. In other words, if it’s broke, fix it. The mobile repair shop, which comes with an industrial Juki sewing machine, will be open to anyone who brings in a garment, no matter what the brand. Besides educating visitors about the brand's "Worn Wear" program, Patagonia also promises a festive atmosphere, with food, drinks, and live music added to the mix. The Worn Wear wagon is, on its own, a sight to behold. A one-of-a-kind custom vehicle created by artist-surfer Jay Nelson, the truck comprises a solar-powered camper shell (made from salvaged redwood wine barrels) mounted on a biodiesel-powered '91 Dodge Cummins. Patagonia created Worn Wear in 2013 as a way to inspire people to make their clothes last a lifetime. The program aims to keep clothing—regardless of brand—in circulation for as long as possible, according to Rose Marcario, Patagonia's CEO. When it's time for a replacement, Patagonia wants you to invest in something that will serve you for years—even decades—to come.